If you are anything like me, you probably make a lot of mistakes in your bullet journal. In fact, just recently I was chatting with my friends in my Billionaire Blog Club community and sharing my latest bullet journal layout with the group. Shortly after posting one of the pictures I took, my friend Kelley had mentioned how she would need to make rough drafts to make hers as pretty as mine. The very spread that prompted this whole post! 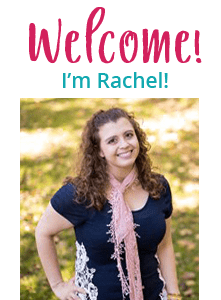 Getting my blog ready for some amazing things! And then she asked me for a post about how to use white out in a bullet journal to fix mistakes! 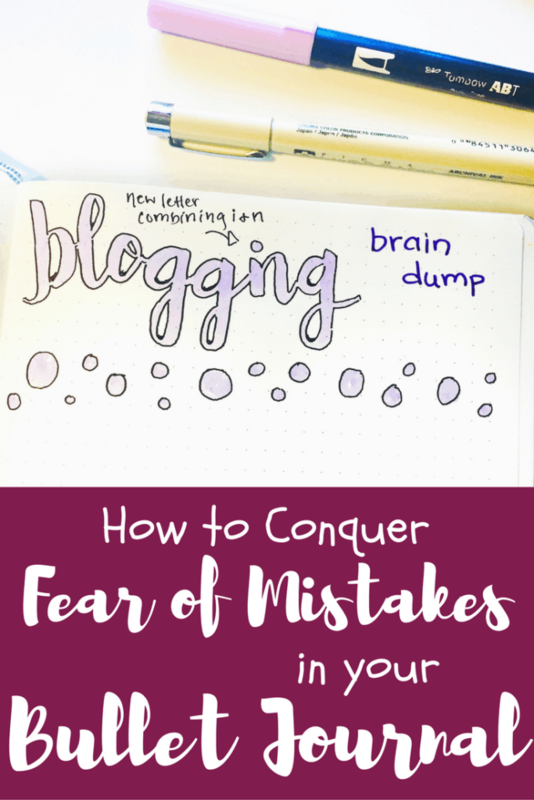 But the discussion got me thinking at a broader level about mistakes in bullet journals, and how to conquer them. 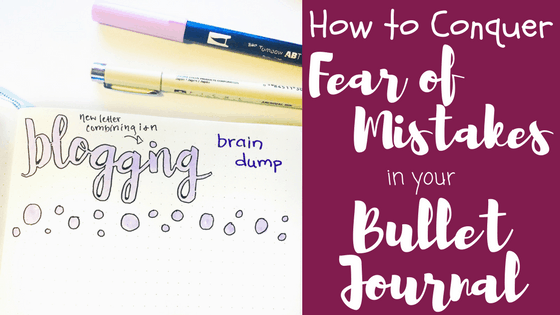 So many people share in the bullet journal community that they fear mistakes. For some, the prospect of a mistake is terrifying. What does it mean to conquer mistakes? It means that you have the proficiency to either work through them, fix them, or use a tool to prevent them. 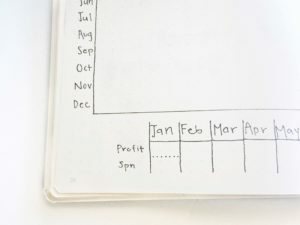 This blog post explores each concept in detail, providing multiple techniques to help you develop mastery to overcome mistakes in your bullet journal. Before we immediately go onto fixing the mistakes in your bullet journal, I want you to stop. Let’s be mindful of this approach first. It’s named ‘Planning Mindfully’ for a reason! I’d like to explore some questions to help give you a better perspective about the mistakes in your bullet journal. However, I’m also not so heartless that I’m going to just give you techniques for pushing past the mental mindblocks. If you just want the fixes, keep scrolling down! But if you want to try to challenge your thinking, I’d really encourage you to read through some of these points. It’s amazing how big we make such a small mistake. If this is an issue you struggle within your day to day life, your bullet journal can be a very safe place to start practicing overcoming it. That’s always powerful, especially if you’re trying to improve your mental health. But if you don’t feel ready, don’t push it. Why Do You Want to Fix The Mistake? What is actually bothering you about the mistake? Are you bothered by it, or are you worried how other people will perceive the mistake? If you are solely irritated with your mistake, we can work together to fix this! One of my followers, vukada_bujo is SO talented! I’m not going to let that stop me from doing my thing though. Even if I’m not as much an expert! 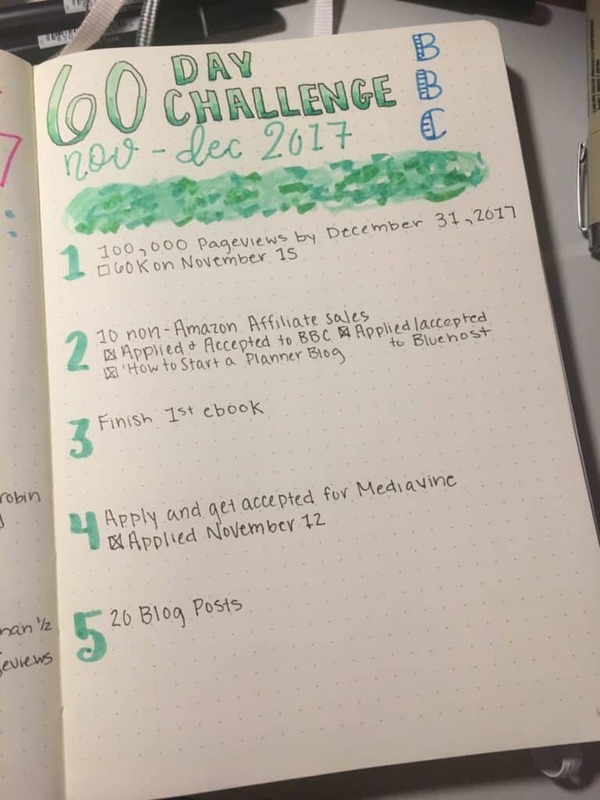 Do you feel like you aren’t good enough compared to other bullet journal artists? Piece of advice: you’re always going to find somebody better than you. That, and people generally don’t show their mistakes. It doesn’t help you feel any better about yourself, but it’s worth noting that you aren’t going to see the mistakes that the very best artists in the world make. If you are frustrated because of how other people will perceive you because of the mistake, I’m going to disclose something that may surprise you. Majority of people won’t even notice. It’s super true. 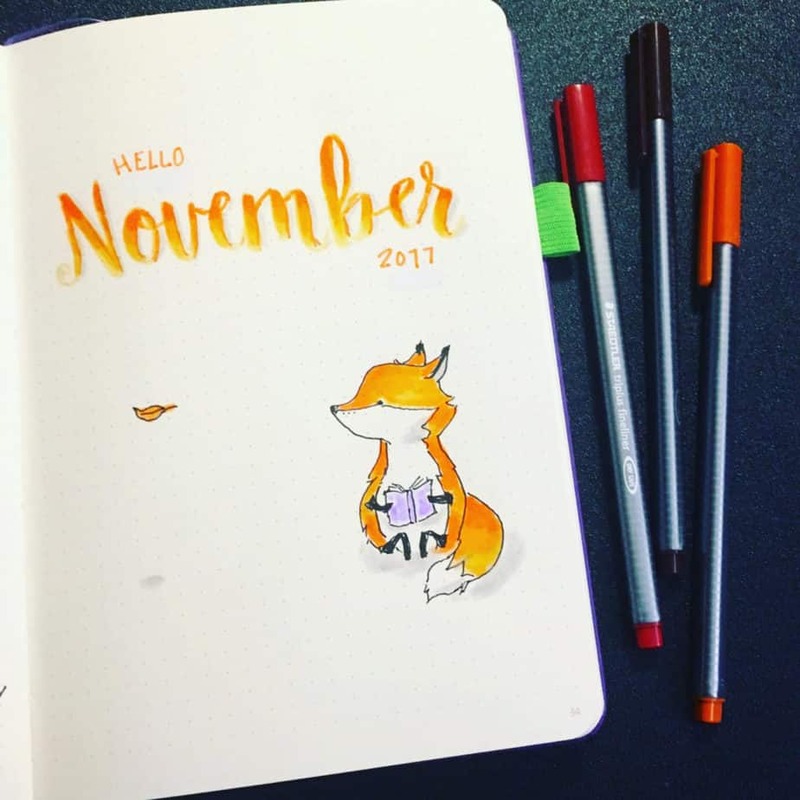 My friend Liddy is a lovely artist in the bullet journal community. If you haven’t seen her stuff, check out her Instagram, it will blow you away. Her art is the standout, and everything else is small details. But she told me that her most popular post on Instagram has a mistake in it. It was so hard to find she had to point it out. Can you even find it? We are seriously our own worst critics. Chances are people are going to love whatever you make, mistake or not. There are some mistakes that are blown WAY out of proportion. If you struggle with perfectionism, it’s hard to sort between the ‘not so bad’ and the ‘really bad’, because it all feels REALLY BAD. What is REALLY BAD? Well, at least to the bullet journal community. Those are things that you can’t you fix easily. Does a shakily-written letter seem that big in comparison? If it does, though (and it might! ), keep reading as I have another really important point to drive home. What Would Your Reaction Be If Somebody Else Did the Same Thing? Let’s move the problem to another person’s shoes. If somebody else posted the exact same image or made the same mistake, what would you do? Is it possible you wouldn’t even notice it if they didn’t point it out? Or, even if you did notice the mistake, would you find their strength to post their hard work regardless endearing? I’m willing to bet your answer is either “yes” or “probably”. I frequently post my ‘oops’ posts to one of my favorite bullet journal group on Facebook, and every single time their responses blow me away! Want to hear some of their responses on my latest blooper? Yes… even I mess up! I don’t think I had one negative comment. When somebody is willing to share a vulnerable moment with others that EVERYBODY experiences, you’ll frequently find that nobody will judge the way you judge yourself. The entire point of the last section was to help you ask the questions that will provide some perspective when you make mistakes in your bullet journal. The other goal was to help with moving past minor mistakes and not fixating on the things you probably won’t even notice down the road. At the very least, if I helped you accomplish at least one of the two objectives in the last section, I think we both win! Make sure to swipe to the other image. See how Sarani fixed her mistake! Now, even if you don’t judge yourself negatively over your mistake, there are still going to be things you’d like to fix. Here’s the part where I dive into techniques that I and other people in our bullet journal community use when we make mistakes. 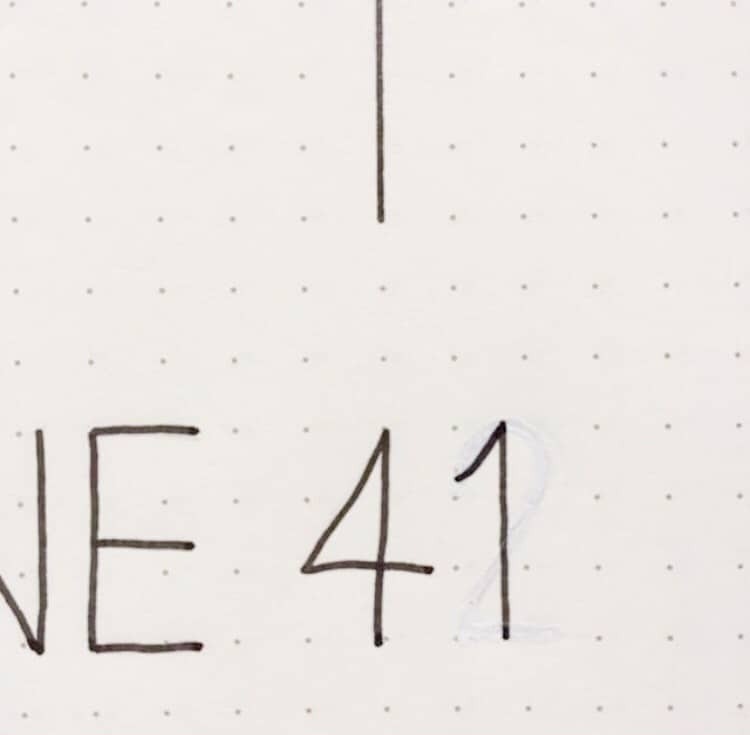 The correction pen or white gel pen is a terrific option for those “oh crap, my pen went a little farther than it should” bullet journal mistakes. It’s also handy for smaller text corrections, like a number or a short word. Personally, a correction pen is probably the better tool option, but I know not everybody has one. After talking to my friend wezz.bujo on Instagram, they shared with me their experiences with this Pentel Jumbo Correction pen along with some photos. Can you see where she used the correction pen? She noticed a mistake on this particular page (this is corrected), and used her correction pen to fix it. From the larger overview, can you see where she used it? From up close, you’ll be able to see the correction, but chances are nobody would ever notice otherwise. If you’d prefer an option that’s a little less expensive and can do a few more tricks, you may like the white gel pen better. The pen I use and recommend is the Uni-Ball Signo White Gel Pen. I’m a huge fan of the BIC Wite-Out Mini Twist Correction Tape. 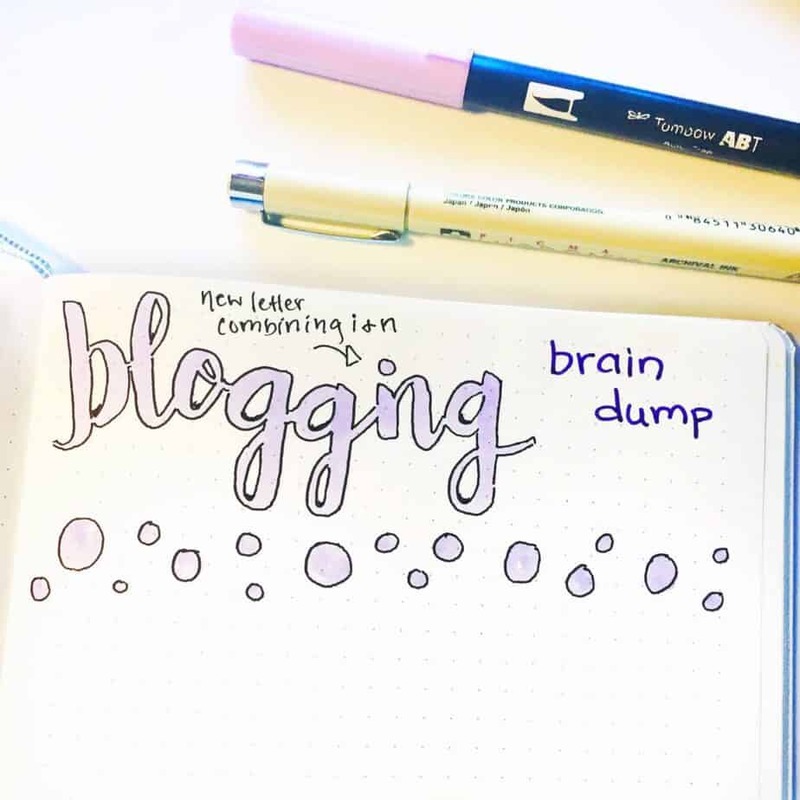 It’s in my top seven favorite bullet journal tools! It’s correction capabilities are a bit larger than the pens, and you’re still going to have a slight discoloration (that you will notice more than anybody else). I wouldn’t say I have a preference between the correction pen and tape. Ultimately you’ll have to try both and see which you prefer! Who doesn’t love a gorgeous sticker? Stickers are great for small mistakes, especially those that have a lot of open space around them. No llama drama over mistakes necesssary! By the way, this shout out goes to Red Fawn Designs over on Etsy! Her llama stickers are so cute! 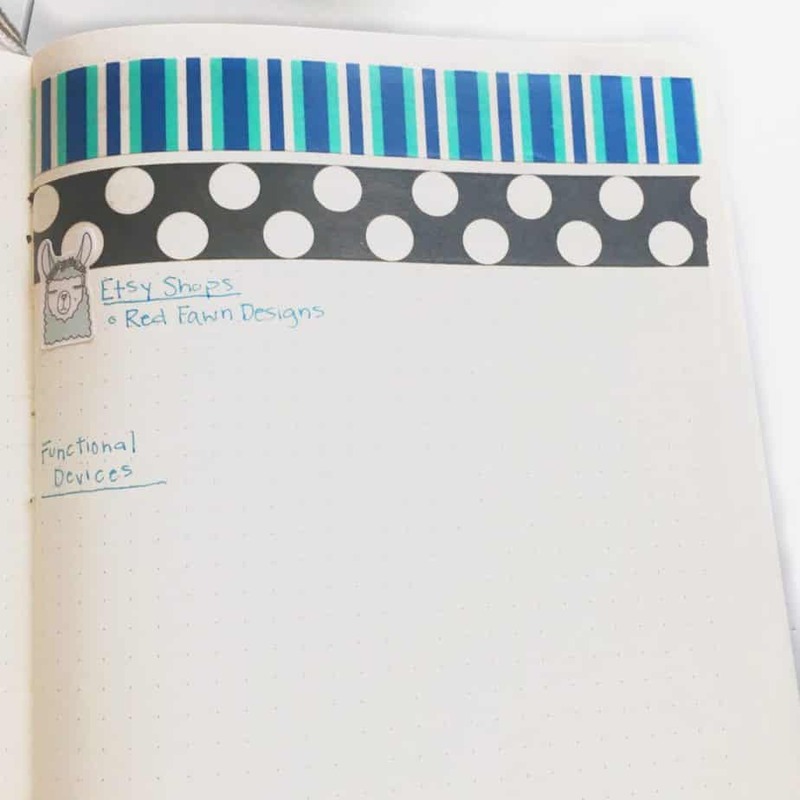 etWashi tape is perfect for fixing mistakes in your bullet journal. I mean, you can pretty much put it anywhere. Not to mention it’s relatively inexpensive and makes bullet journal spreads super cute! If you saw the image example above (the one with the llama sticker), I’m sure you also noticed two lines of washi tape. Did you remember that I said I ran out of my double sided tape about a third of the page in? The sticker fixed the little nib where it ran out. The washi fixed the first two full lines of the double sided tape. It wasn’t how I was initially going to fix the page (I was going to do the double sided technique due to some ghosting). However, the washi tape accomplished hiding the ghosting from the page behind it, while preserving the integrity of the page as a whole. I messed up writing goals. So I did it on another piece of paper, cut it out, and taped it on! Creativity is interesting because it doesn’t so much fully fix the error, but you find a way to work through it regardless. It’s the artist version of turning lemons into lemonade. My friend wezz.bujo messed up drawing ’34’ in black ink. So she made a black banner and drew the number in white! 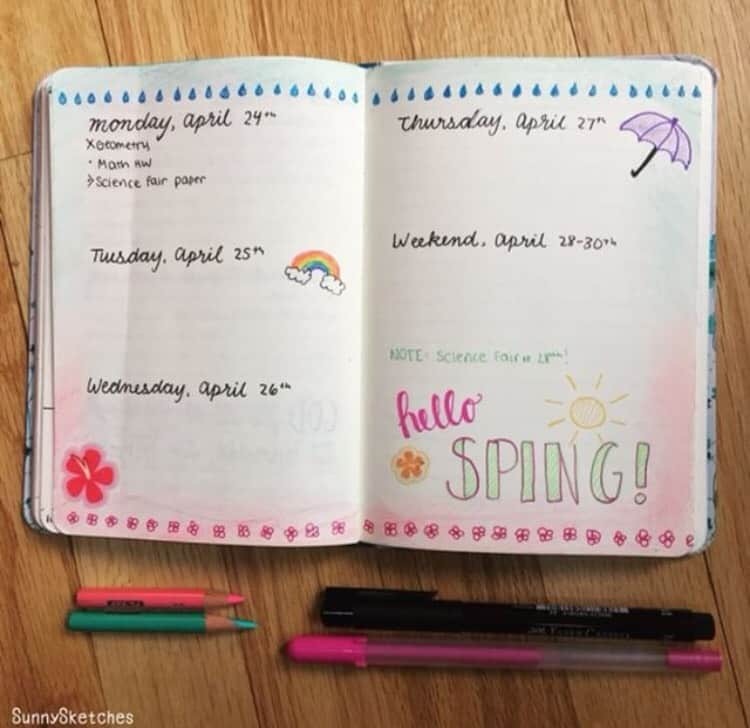 Can you color over the mistakes in your bullet journal? 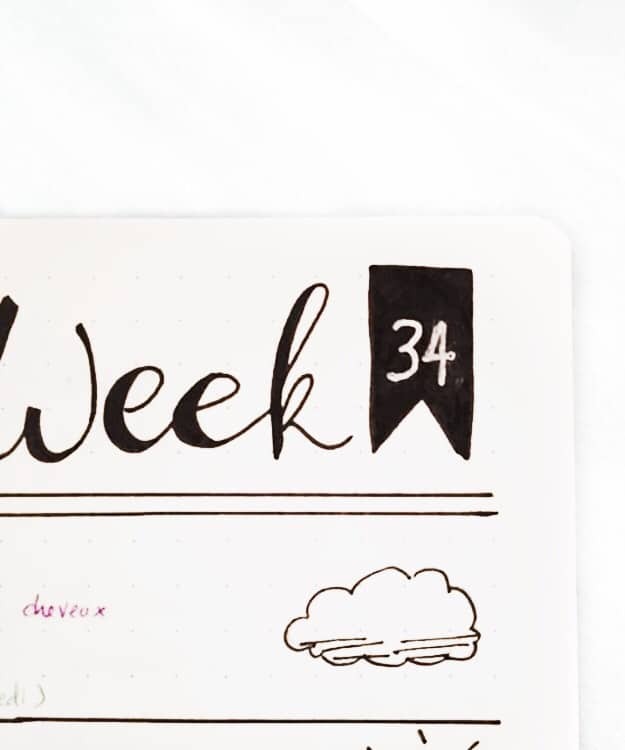 Can you turn that extra day of the week in your calendar into a tracker? What about changing the lopsided circle into a funky snowman? This is where having a theme can actually be SUPER helpful when you run into these scenarios, too! Is there another thing you can create that relates to your theme instead? I love to use humor for mistakes. 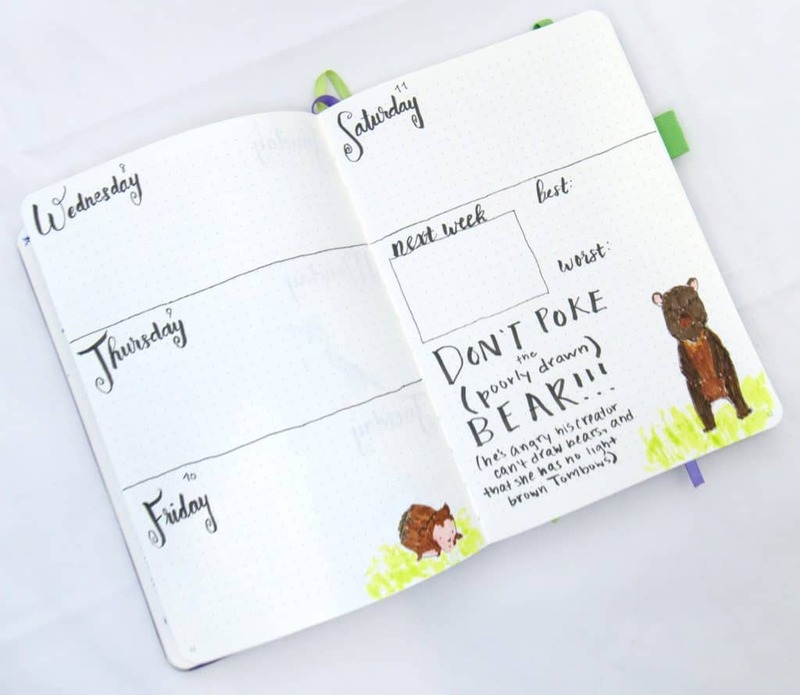 Humor really can turn the negative tone down for mistakes in your bullet journal. 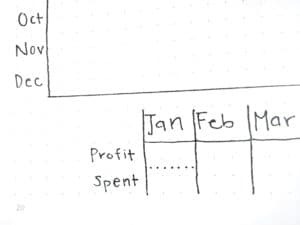 When I created my first official calendar for my bullet journal, I instantly made a glaring mistake bright and center. 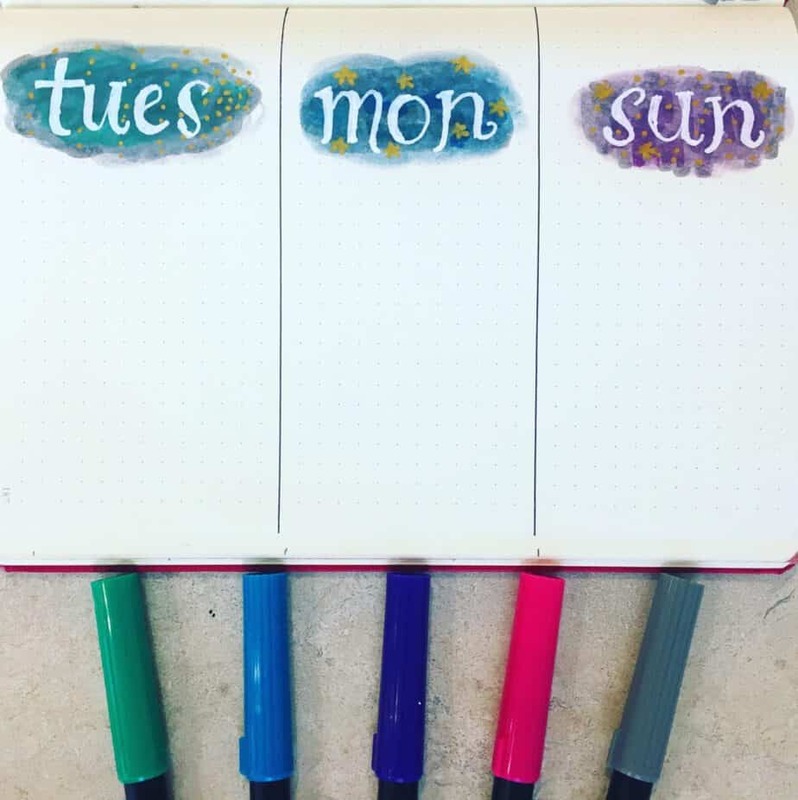 I was writing out the days of the week and my brain started to right Monday… and I stopped immediately after the M. Although I had a moment of panic, I got some inspiration off of another person’s mistake on a group. 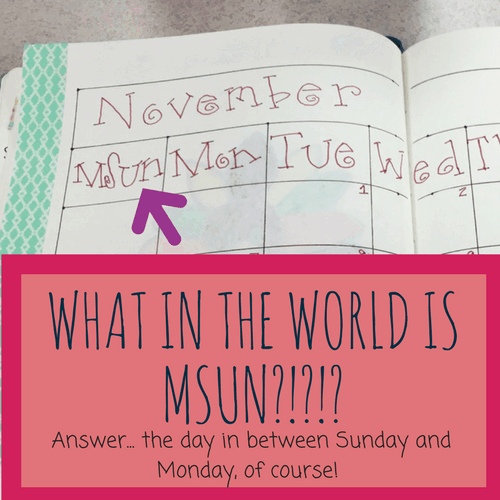 Then I just decided to write in ‘Sun’ after the M.
You know, the magical day in between Sunday and Monday, right? A follower on Instagram, sketches.sunny, shared another funny story about one of her mistakes. Isn’t that funny though? I know if you’re the one who made the mistake, it’s not always as funny. But she shared that now whenever she makes those types of ‘oops’ in her bullet journal, they are called ‘Spings’! I think I’m going to have to use that for myself! The other thing I did once when I drew something really awful was just write a silly quote acknowledging how awful it is. May as well not let all that work go to waste! Don’t even ask about that poor creature that resembles a mix of a porcupine and monkey!!! Honey.tea.paper on Instagram does a similar technique. She will actually write things like “nobody is perfect” or “mistakes happen” next to her mistakes. Sometimes, you can’t just fix the mistake to your liking. Regardless of whether you attempt to fix it or not, you feel the need to redo the page. But sometimes in this scenario there is a LOT of empty space left in your page (like if you make the mistake early on in creating the spread). The other scenario to consider is maybe it’s on a page that you can’t get rid of easily (there’s an important page on the backside. So… use it for something else! Use it to practice whatever you messed up on. Work on your penmanship. Use it as a brain dump or doodle page. Ok, so double sided adhesive tape doesn’t ‘fix’ the mistake. But it hides it by taking two pages together so it’s like you’d never know that there was something missing. The Tombow Adhesive tape is AMAZING!!!! 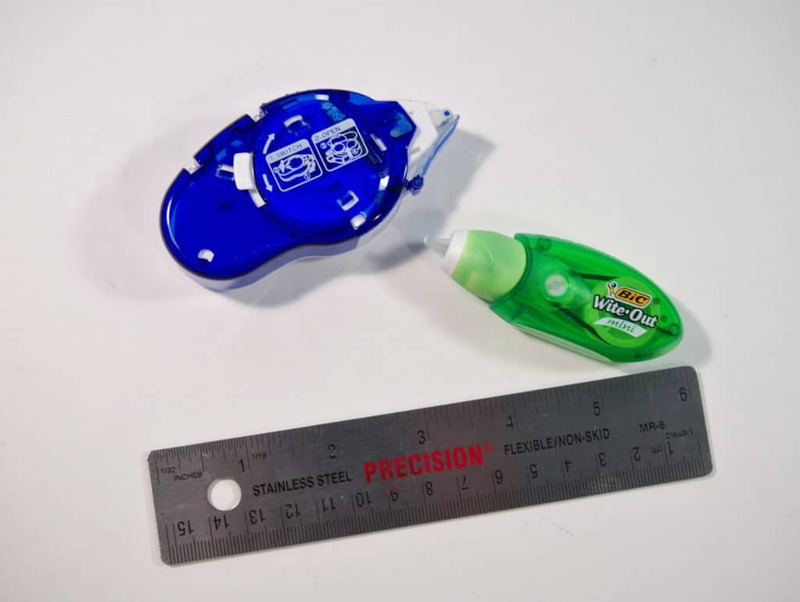 If you make a mistake that is particularly challenging and you have very critical information on the other side of that page, double sided tape can frequently help solve this scenario. In cases like this, ripping out the page would mean you’d have to redo TWO spreads instead of one. How do you use double sided tape in this scenario? Open the offending page and either tack or roll on the tape. I recommend a layer on each end of one page, and generally one or two in the middle. My trick to avoiding awkward bubbles or creases in this scenario is to just shut your bullet journal quickly rather than just trying to tape the two pages together. When your book is closed normally, the pages typically fall into place more naturally. You may have one page a little thicker, but it’s really been a time saver for me! Yes, you can choose to get rid of the page entirely if you are unable to find a mental solution to work through the problem, or one of the ways to fix it isn’t helping. So in this scenario, you can either rip out the page or cut it out. Ripping it out, done very carefully, can prevent that super awkward piece of page that would be left if you just cut it out. But if you don’t rip it out from the binding, you could have ragged pieces of page remaining. If you cut it, chances are the tiny piece of page remaining would be straighter. Beware: When you rip out a page, you do run the risk of affecting the binding of the other sheets in your notebook. 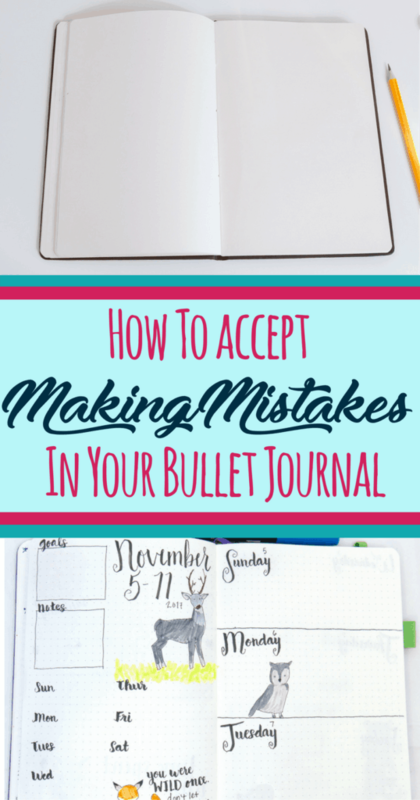 There is no surefire method to use that’s going to prevent all mistakes in your bullet journal. Sometimes they just happen, and we don’t have control over it. I certainly hope the techniques in this post provided you the inspiration you need to work through majority of mistakes. 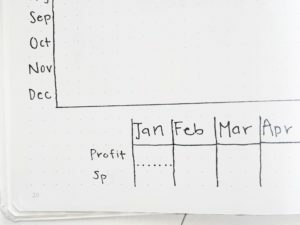 Now, if you are a frequent mistake offender (aka you are consistently making the same mistakes in your bullet journal), you may find this section beneficial. While there is no surefire way to fully preventing any mistake, these particular tools and techniques can help tremendously by helping you not make them as frequently. Thankfully this spread turned out ok. I should have practiced the technique first! Nobody creates a masterpiece without practice. And if you are brand new to drawing floral doodles, there is a higher than not probability that your first dozen attempts aren’t going to look the greatest. But instead of immediately putting these newbie attempts in your bullet journal and agonizing over their appearance, try practicing first. There’s no rush or contest to get it out in your spreads as soon as humanly possible. 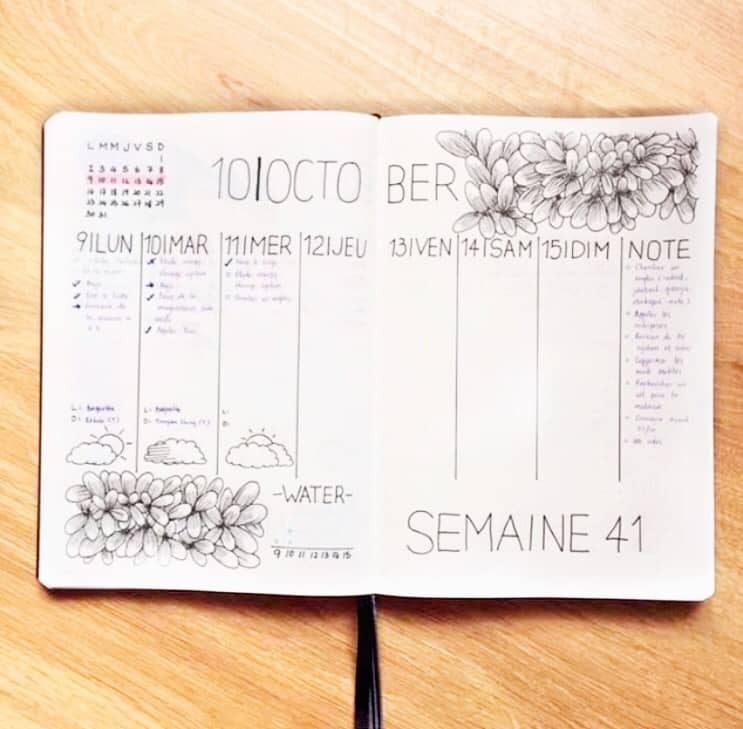 Get to the point where you feel satisfied with your work, and then transfer the attempts in your bullet journal. 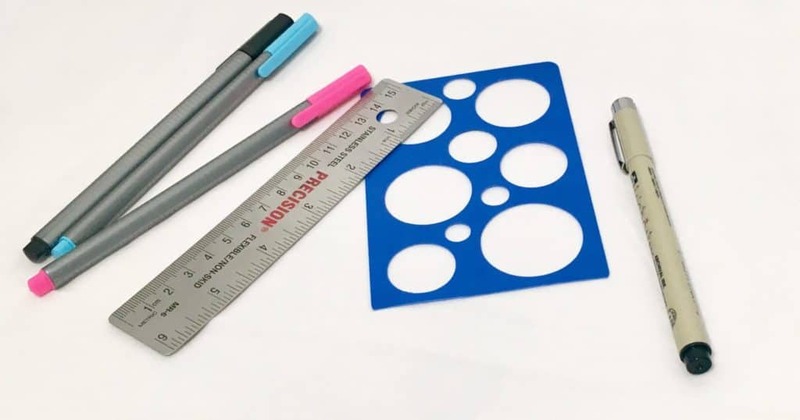 If you need a dot grid notebook to practice in, consider an inexpensive dot grid notebook. Or, really, any notebook or sketchpad you have laying around. At least put all those empty notebooks you have laying around to good use! I never used pencils until recently because I can’t stand the eraser marks. 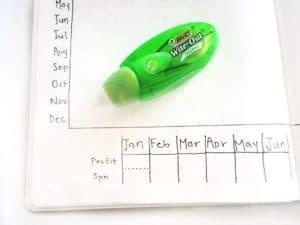 You may not know this, but there are a LOT of bullet journal artists who will actually create majority of their page in pencil. Once they get it to a place they like, they will draw over the pencil marks with a fineliner. Once the pen marks are completely dry, they use a good eraser to erase the rogue pencil marks. Some of us may never have the ability to draw a straight line free hand, write beautiful letters with ease, or doodle a gorgeous flower. I definitely recommend continuing to practice, but in the mean time, maybe consider a tool to help? A tool doesn’t indicate weakness in any form. The only thing it means is that you want to keep trying, and that you are open and willing enough to do whatever it takes to achieve your objective. Some tools physically assist with preventing mistakes, while others provide mindfulness and vision to move past them. A mental tool is a bit harder to convey specifically, but here is a personal example that I believe explains the concept better. I can draw well, and I can letter well. In spite of that, no matter how hard I try, I’m not good at visualizing things mentally. In fact, mental visualization has always been my weakness. Despite this weakness, I don’t desire to let my natural talent to draw and letter go by the wayside. I created this pin with the assistance of THIS pin. Just kept it on the screen for reference! My most handy non-physical tool that I utilize is actually having the image immediately available. Thanks to the Internet and Pinterest, this is extraordinarily easy to do. All I need to do is find a font or an image that I want to emulate, keep it on the screen, and go to work. Having something to visualize, even if it isn’t directly contributing to my ability to do the task, makes my life much easier. 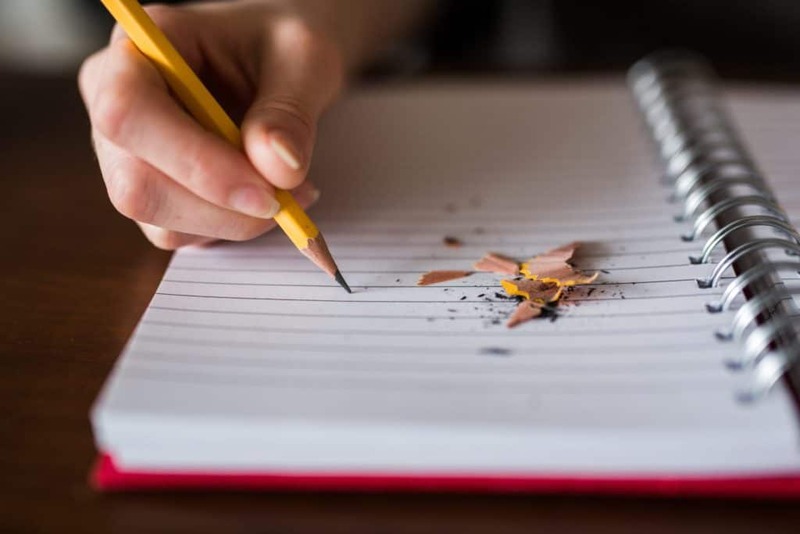 First, I really advise to use this point sparingly, as I am a firm believer that between practice or using tools that you can overcome most mistakes in your bullet journal. Ultimately, though, there may be something you come across that continually confounds you. No matter how hard you practice, you continue to struggle and make mistakes. Or, there may not be a tool that can help you. Eventually you may come to a time where you’ve exhausted all other efforts, and you continue to struggle mentally with making the mistake, maybe it’s just time to stop. No shame in keeping it simple! Yes, typically flowers don’t have teeth, but this one does! I’m a firm believer you can fix 99% of your mistakes in your bullet journal, either through physical adjustments or mindset shifts. I can guarantee that 100% of you will make a mistake (though I don’t think that many will readily admit it). And ultimately, trying just one of these techniques isn’t going to give you ‘instant mastery’ for handling mistakes in your bullet journal. They are wise and profound words. Keep trying. Keep practicing. Continue to work through the challenges. I guarantee you will find more satisfaction with yourself in the long run. 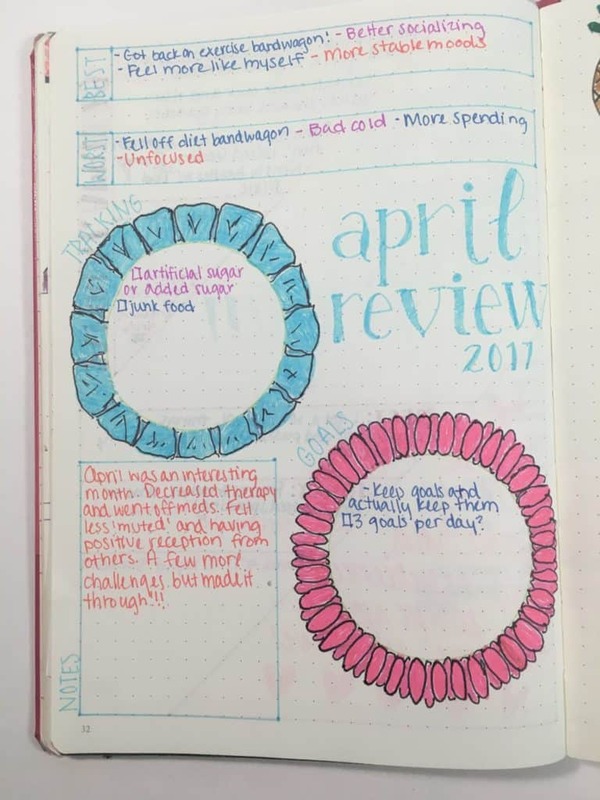 What do you do when you make mistakes in your bullet journal? Use a technique I haven’t mentioned? I’d love to hear more about it, so please tell me all about it in the comments! Who knows, maybe somebody else in the community will find it very useful! And as always, if you’re struggling, my doors are open. Well, communication doors. Please click here to contact me and I can work through helping you! PS- For those who contributed to this post through Instagram, I can’t thank you enough! I’ve received so many lovely suggestions, words of understanding, and overall support for the transparency I’m trying to bring into the community. 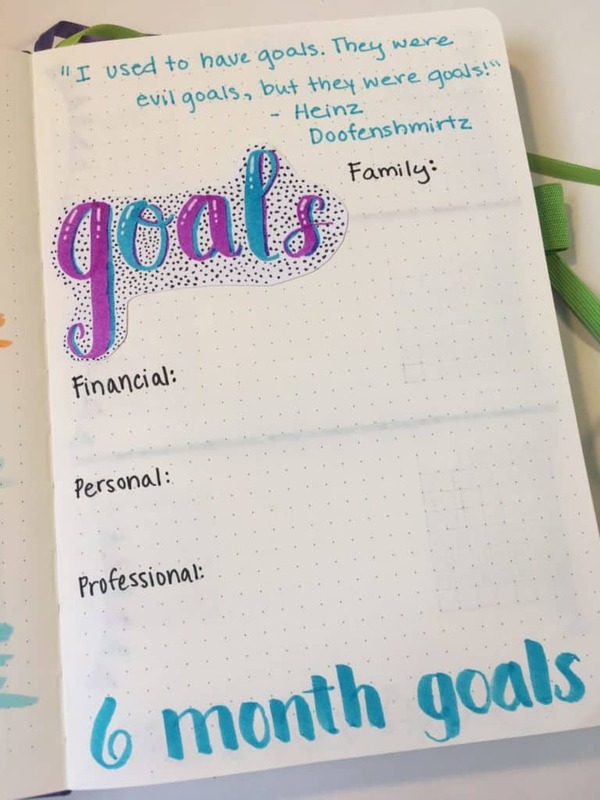 Together, we can break the bullet journal stigma by helping everybody understand that mistakes are a normal part of life! 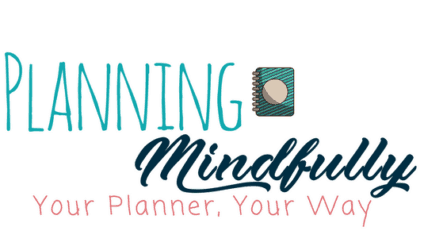 This has probably been one of the most rewarding posts I’ve written, and I couldn’t have done it without the fantastic planner community we have. Please take a moment and share it on Pinterest! Thanks so much for the great advice. I have been stuck in a rut journaling and these tips and guidance has helped me find a new direction. Thanks so much! Hi Johnette! I’m happy that I could provide some direction for you! You are very welcome, and thanks for letting me know! If you ever need more help, don’t hesitate to leave another comment or reach out on my contact page. Thank you A MILLION for this. I have been “trying” to really start my bullet journal for nearly 6 months. Despite researching spreads, buying all of the supplies to make it as easy as possible (including all 96 Tombow dual brush pens), and even completing a handful of pages, I could never fully get into it (even though I absolutely loved the idea and knew that it was something that I needed) because I was so afraid of “messing up” and getting frustrated. This article really put my mind at ease and I going to officially start it TONIGHT!!! SO THANK YOU!!! Kathryn – Way to go!!! I mess up, and so do a lot of my bullet journal friends who are amazing artists. I’m proud that you are taking the first step to move past your fears.